Torquay United midfielder Nathan Craig says he hopes his continued good form will help improve his chances of a call-up for Wales Under-21s. He plays alongside fellow Wales Under-21 international Billy Bodin at Torquay and would relish a recall. "Hopefully if I keep playing for Torquay maybe that might give me my chance," Craig told BBC Sport. "Every kid's childhood dream is to play in the Premier League and play for your country," added Craig, who has played in every Welsh age group side from the age of 15. 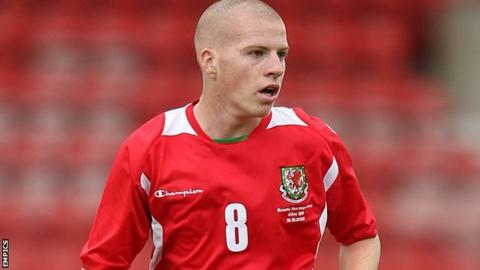 He has played four times for Wales at Under-21 level, and has not been in the squad since the game against Andorra in March 2011. Craig joined Torquay in February on a trial basis but had to wait until this season to make his debut as a substitute in the at the end of last month. He began his career as a youngster at Everton where he played on the wing, but has thrived in a central midfield role for Torquay. "When I was at Everton I was a winger to basically make the numbers up because of the reserves," he said. "I've always seen myself as a central midfielder, but because at Everton there were so many players playing there they just put me out wide. "When I went back to Wales I was playing in central midfield so I got some good experience there before coming here. "When people say I'm a winger, I don't see myself as a winger, I see myself as a central midfielder." And his manger, Martin Ling, says he is impressed by the versatility that Craig has shown. "The more I watch the kid play in numerous positions the more he impresses," he said. "He's a good footballer who can play in a multitude of positions."